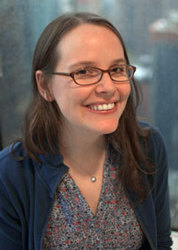 Raina Telgemeier is the author and illustrator of the graphic novels Smile, Drama, and Sisters, all #1 New York Times bestsellers. She also adapted and illustrated four graphic novel versions of Ann M. Martin's Baby-sitters Club series, and has contributed short stories to many anthologies. Raina's accolades include two Eisner Awards, a Boston Globe-Horn Book Honor, a Stonewall Honor, and many Best Of and Notable lists. Raina lives and works in San Francisco, CA.